View More In Misting Parts & Accessories. This 5-pack of durable Orbit PVC clamps easily attach misting system tubing to your deck or patio. These Orbit hanging clamps work with 1/2-inch sized mist outdoor cooling systems. 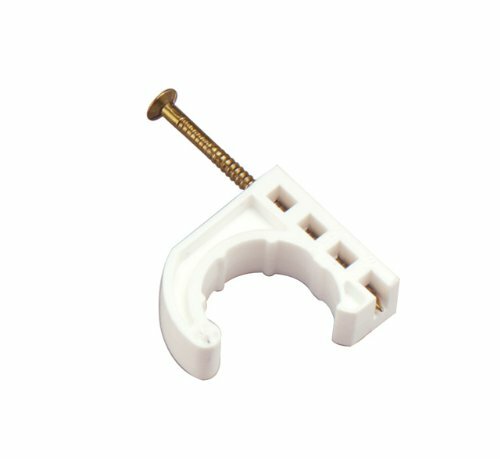 Each water mist system mounting clamp is white to match the white PVC pipe of your patio misting system. The clamps come with an inserted nail for easy tapping into place to tightly secure your outdoor misting system tubing. These home misting system hanging clamps are easy to install and are durable for many years of water mist system use. Features and Benefits: Convenient pack of 5, Inserted nail simply taps into place, Perfect for mist outdoor cooling system securing, Made of durable PVC.